I don't think one exists without the other. Think about it, how many of you went out and bought fireworks for the family to set off on the 4th of July? I didn't, and none of my female friends did, but all of the men I know did! Now, don't get me wrong, I love fireworks. There's nothing better than sitting out on a beautiful July evening, with the family and some good friends watching a professional fireworks show. What I'm not too crazy about is a bunch of husbands, setting off fireworks in the backyard! Moms tend to be a little (okay, way, more) cautious than dads. If I had my way, my kids would be a good 50 yards away from the person who is lighting the cherry bombs, bottle rockets, M-80's, and such. But that doesn't happen in my house. My husband thinks the kids (future men, which means future fireworks purchasers) are perfectly safe just behind his shoulder, watching, learning life's pyrotechnic lessons. He thinks I'm a "little crazy" when it comes to worrying that one of them will get hurt. My 10 year old, told me "Not to worry. We're men. We know what we're doing!" Well excuse me for not being comforted by the proclamation of a boy eight years away from being old enough to legally purchase fireworks! So, as my friend Laurie and I tried to steer the kids away from the fireworks our husbands were eagerly setting off, it dawned on me. If there's testosterone involved, there's going to be fireworks. I might as well get used to it and just pray that no one gets hurt. 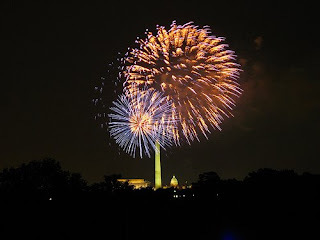 In VA it's illegal to set off fireworks unless you have a permit, however that didn't seem to stop any of my neighbors from setting them off until the wee hours. I have to say that I did enjoy watching them, but I'm always a little scared that one's going to come flying into my backyard! We worry because we have to! I think you're right! I'm 38 years old and have never once even thought about buying fireworks but my husband has been buying them for years! so funny. I'm so freaked out by backyard fireworks...totally stresses me out. My hubby? Not a problem!